The Ritz-Carlton, Los Angeles features 123 well-appointed guestrooms, including 14 suites and the 3,000 square-foot The Ritz-Carlton Suite. The hotel is home to WP24 Restaurant & Lounge, offering celebrity chef Wolfgang Puck’s modern interpretation of Chinese cuisine, and more than 100,000 square-feet of meeting and event space. Guests will enjoy the best views in Los Angeles from virtually any part of the stunning L.A. luxury hotel, including the 3,400 square-foot signature Ritz-Carlton Club Lounge and the exclusive, private rooftop pool and bar on the 26th floor. 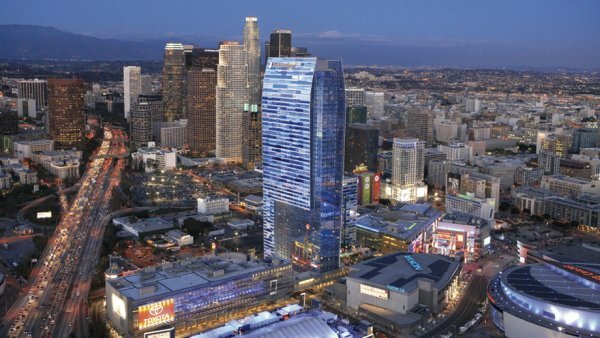 The Ritz-Carlton, Los Angeles shares space with JW Marriott Los Angeles L.A. LIVE and The Ritz-Carlton Residences at L.A. LIVE in a distinctive, 54-story Silver LEED Certified tower. 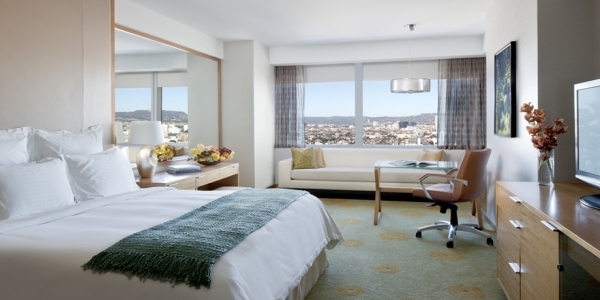 Located steps away from STAPLES Center, Nokia Theatre L.A. LIVE, The GRAMMY® Museum and an array of restaurants, entertainment venues and nightspots, this downtown Los Angeles luxury hotel is at the heart of the city’s most dynamic neighborhood. The Ritz-Carlton, Los Angeles specializes in pairing ideal conference rooms with impeccable service. From exclusive board meetings, to product launches or corporate-wide celebrations, we ensure all your events are memorably excellent. The Ritz-Carlton offers over 100,000 square feet of flexible meeting space, including 40 distinctive Los Angeles meeting rooms and three ballrooms. Surround yourself with Los Angeles sophistication and classic Californian cool at The Ritz-Carlton, Los Angeles which offers guests a boutique hotel experience and world-class service in the center of the city. Located on floors 22-26 of the distinctive 54-story tower, The Ritz-Carlton, Los Angeles features 123 contemporary guest rooms including 13 luxurious suites and the 3,000-square-foot Ritz-Carlton Suite. The Ritz-Carlton Club Lounge, located on the 23rd floor of the hotel with panoramic views of the city, is available for guests seeking a heightened level of luxury and privacy. Combining comfort and exclusivity with personalized service and attention to detail, the Club Lounge also offers a dedicated concierge to attend to the individual needs of its guests and continuous food & beverage offerings throughout the day. The Ritz-Carlton Club® Level on the 23rd floor redefines the luxury hotel experience, combining intimacy, comfort and exclusivity with the personalized service and attention to detail that are the hallmarks of The Ritz-Carlton. This oasis is often referred to as a hotel within a hotel, where a dedicated concierge attends to individual needs in a well-appointed, relaxed lounge environment. Spectacular views to the west include the Hollywood Sign, Santa Monica Mountains, and sunsets to the ocean. With continuous culinary offerings throughout the day (breakfast, light snacks, hors d’ oeuvres, beverages and sweets) and access to a computer station – it is the ideal place to conduct business, plan a family outing or simply unwind. The Reeo, or any other sbe restaurant, including Katsuya, The Bazaar by José Andrés, Mercato di Vetro and Gladstones. The Ritz-Carlton, Los Angeles offers a dining experience to suit every occasion—from a casual bite poolside to a multi-course dining experience at the award-winning WP24 Restaurant & Lounge. WP24 Restaurant & Lounge offers chef Wolfgang Puck’s modern interpretation of traditional Chinese fare on the 24th floor of The Ritz-Carlton, Los Angeles while floor-to-ceiling windows provide stunning panoramic views of Downtown Los Angeles and the surrounding city. The dining room offers several menu options from a three-course prixe fixe to a 10-course tasting menu while the lounge features a more casual experience with plates meant for sharing and an extensive selection of sushi. Wine aficionados appreciate an extensive list of more than 400 labels plus nearly one dozen brands of sake that have been selected to complement the complex flavor profiles of the menu while specialty cocktails with an Asian twist are also available. Sunday, 4 p.m. – 10 p.m.
Monday – Saturday, 5 p.m.- 12 a.m.
Monday – Thursday, 5:30 p.m. – 10 p.m.
Friday & Saturday, 5:30 p.m. – 10 p.m.
LA Market Restaurant by Kerry Simon “Rock n’ Roll Chef” captures modern American cooking with California flair. Starters include Wok Charred Edamame with ginger sea salt and Crisp Fried Calamari with spicy Asian ponzu. Located on the lobby level of the JW Marriott Los Angeles at L.A. LIVE, the menu also offers a selection of pizzas such as Meatball with oven roasted tomatoes and ricotta and classics such as The “Meatloaf” with mashed potatoes and Bricked Organic Chicken with organic farro, braised beet greens and citrus jus. The dessert menu recalls the classics with the Twice Baked Banana Bread with spiked caramel, malted brown sugar crunch and bourbon ice cream and the Junk Food Platter, which features childhood favorites like cotton candy and hostess cupcakes. The wine list emphasizes California producers and innovative cocktails, handcrafted with fresh ingredients, encourage guests to linger. Breakfast: Sunday – Saturday 6:30 a.m. – 10:30 a.m. Lunch: Sunday – Saturday 11 a.m. – 2:30 p.m.
Dinner: Sunday – Saturday 5 p.m. – 10 p.m.
An authentic Italian-style café focused on coffee and light gastronomy. Designed with a modern and innovative look, offering customers a unique experience designed by Luca Trazzi. Illy’s trademark colors of silver, red, and white, expressing a sleek, fresh and contemporary atmosphere. Illy food embodies the excellence of Italian cusine, combining fresh, high-quality ingredients with the creative flare of the numerous chefs who created each recipe. Open Daily 5 a.m. – 10 p.m.
gLAnce Wine Bar is open daily from 11 a.m—1:30 a.m. World-class mixology, innovative small plates, lush and comfortable design and the ideal location in LA for star gazing and people watching. The Mixing Room maintains a spirit rooted in warmth, hospitality, and a sense of fun. This venue defines cutting edge mixology: syrups, infusions, house made grenadine, egg whites and classic cocktails reinvented for a modern audience. While the cocktail menu features contemporary flavors, exotic spirits, unique tinctures, and dramatic garnishes, each of the cocktails are lightening fast to prepare during service. Enjoy cocktails and appetizers at both our indoor and outdoor seating. Located on the lobby level of the JW Marriott Los Angeles at L.A. LIVE. Open daily 4 p.m—1:30 a.m.
ION, located on the 4th floor of the JW Marriott Los Angeles at L.A. LIVE, is Los Angeles’ hottest new open air. The sophisticated space offers views of the Los Angeles skyline and L.A. LIVE and offers cocktails and appetizers daily.